Can you suggest any Valentine's Day gifts for cats, Thomasina. I want to show my cats how much I love them. Thanks for asking. I love recommending Valentine's Day gifts for cats! I'm sure you know this, but the best gift you can give your cats on Valentine's Day and every day is your undivided attention. So turn off your phone, TV and computer for half an hour or so and concentrate just on them. Go for a walk together, or play with an interactive wand or fishing pole toy, or just sit with them and talk with them. They'll love that! Here are some ideas for Valentine's Day gifts for cats for you. Clicking on the links will take you to Amazon. We get Yeowww Catnip Hearts every year. They're a Valentine's Day tradition here. The hearts are stuffed with super-potent organic catnip. We love these things. They make us very happy! Belle and Muffitt and I like to swat them around. Sizzle likes to collect them in a pile and sleep on them. We just got a Cat Craft Tunnel Bed, and we love it! There's a soft, comfy pad inside the tunnel for napping. And the upholstery fabric on the outside is great for scratching, although I don't think it was meant for that purpose. 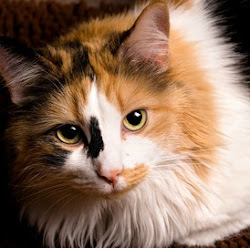 The tunnel is just three inches off the floor, so it's easy for older or overweight cats (are you reading this Sizzle?) to get in. And at 14 inches wide by 17 inches long, it's big enough for even a very large cat, like Sizzle. Toys make great Valentine's Day gifts for cats, and this Electronic Fluttering Butterfly looks like fun. Maybe our human will get one for Muffitt and me. We love to chase bugs! This toy has a broad, heavy base so it won't fall over when your cats are playing with it. The wire is about 9.5 inches long. The butterfly is 2.8 long by 5.3 inches wide. I've saved my favorite toy for last. Hot Cats make the best ever Valentine's Day gift for cats. They're made from really sturdy denim twill and stuffed with very potent organic catnip. When the catnip loses its punch, rub the toy between your hands to refresh it. Hot Cats seem to last forever. Some of the ones we have are older than I am, and all the cats are still playing with them! I hope this gives you some ideas, Adore My Cats. Hey, could you help us out? 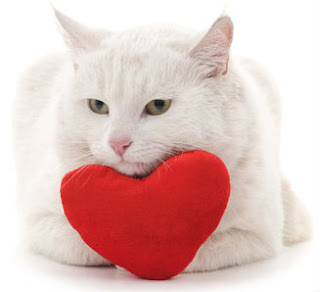 What's the best Valentine's Day Gift for cats to give a human? Do you think she'd like a catnip heart?